The researchers tested this concept by coloring cool roof coatings with ruby red (aluminum oxide doped with chromium). Led by Berkeley Lab scientist Paul Berdahl, they first found that white paint overlaid with a layer of ruby crystals stayed as cool as a commercial white coating. 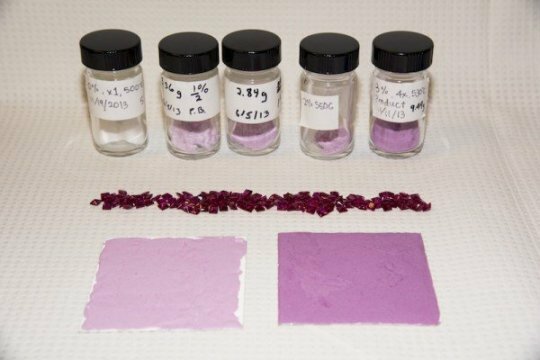 Next, they synthesized ruby pigment to mix into coatings. Their results were published recently in the journal Solar Energy Materials & Solar Cells, in an article titled "Fluorescent cooling of objects exposed to sunlight — The ruby example." However, wider adoption of cool roofs has been hindered by aesthetic considerations. "We've heard many times (from roofing materials manufacturers), 'we can't sell white or pastel roofs; our customers want dark green, dark brown, and so on,'" Berdahl said. Over the past 15 years, Heat Island Group researchers have used special pigments that strongly reflect invisible "near-infrared" light to make dark surfaces that stay cooler in the sun than conventional dark surfaces, though still not as cool as white surfaces. This new work shows that fluorescent cooling can boost the performance of these pigments by re-emitting at longer wavelengths some of the visible light that the surface must absorb to appear dark. This opens the door to darker colors of not only cool roofs but of any object that is subject to prolonged periods of sun exposure, including vehicles, ships, storage tanks, and PVC piping. "We do think cars will be a likely application," Berdahl said. "And it's not just a matter of comfort or saving energy by avoiding AC use. We learned from colleagues that with electric vehicles, the battery lifetime is degraded by higher temperatures, so if you can keep the automobile cooler with use of a suitable coating then it extends the life of the battery." Using fluorescence, or photoluminescence, for cool materials is a new concept, and Berdahl, who is a physicist by training, has a patent pending on the technology. "People understand that materials that fluoresce are emitting energy," he said. "What's new here is the use of the fluorescence process to keep buildings cooler." When light hits a fluorescent material, the material actively emits energy in response, rather than passively reflecting the energy. Berdahl's idea was to find a material that would absorb visible light and fluoresce (re-emit) mostly or entirely in the invisible near-infrared portion of the sun's spectrum. "There have been thousands of fluorescent compounds identified," he said. "Ruby's properties are well known and well studied, and I realized it's a material that could work." "The ruby powder does need more work to make it as deep red as the ruby crystal," Berdahl said. If the product were to be commercialized, Berdahl said that the cost is not expected to be substantial and its durability is expected to be similar to other coatings. "Rubies have a reputation for being expensive, but they're mostly aluminum oxide, which sells for about 70 cents per kilogram (or about 30 cents per pound)," he said. The above post is reprinted from materials provided by Lawrence Berkeley National Laboratory. Note: Content may be edited for style and length.